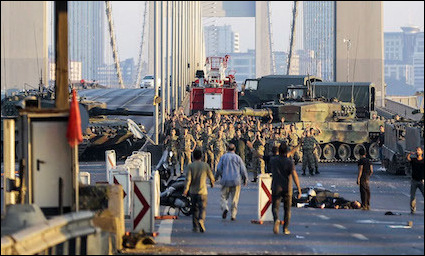 Tanks and soldiers closed the Bosphorus bridge in Istanbul as Turkey was plunged into chaos for a few days in July 2016 when an attempted coup threatened to overthrow the Erdoğan government. On the evening of July 15, 2016, the inhabitants of Ankara and Istanbul left their dinner tables in panic and rushed to their windows and balconies. What they saw was shocking and surreal, if not apocalyptic: tanks closing the Bosphorus bridge in Istanbul and encircling the parliament; rival F-16 raids against government and coup forces; military brass being taken hostage by their aides; combat between the military and the police, followed by soldiers attacking civilians; and finally civilians lynching soldiers who had supported the coup. All of this happened at a time when no one was expecting a putsch, even in a country torn by ethnic strife, perpetual terror attacks, and deep ideological polarization. Turks soon learned that the coup attempt had not been staged by the military's top brass but by dissident officers. A similar attempt on May 27, 1960, had succeeded, leaving behind the bodies of the executed prime minister and foreign minister. When in 1971 the military issued an ultimatum to the government of Prime Minister Süleyman Demirel, the prime minister resigned. The military intervened again in 1980, but Gen. Kenan Evren, elected president after the coup, resumed parliamentary democracy in 1983. Things would go smoothly until 1997 when the generals, deeply annoyed by the coalition government of Turkey's first Islamist premier, Necmettin Erbakan, forced him out, not by sending tanks into the street but by masterminding political intrigues that led to the collapse of his government. In 2007, Turkey's top general issued a statement on the military's website, warning the Islamist government of then-prime minister Recep Tayyip Erdoğan against any move that might undermine Turkey's secular regime. Erdoğan did not retreat. Instead, he launched a full-scale struggle "against military tutelage" and had his long-time Islamist associate, Abdullah Gül, elected president of the country. In 2011, the entire military leadership, including Chief-of-Staff Isik Kosaner, resigned in protest over a slew of trials that put hundreds of officers in jail on fabricated evidence of planning a coup. Since then, the top command has been loyal to Erdoğan. The perpetrators of the July 15 coup attempt are widely believed to be a coalition of officers: members of the "Gülen" group, who had infiltrated military ranks and successfully hidden their ideological leanings, often by drinking alcohol publicly and showcasing wives without Islamic headscarves; Kemalists loyal to the republican tradition of modern Turkey's founding father, Mustafa Kemal Atatürk, and opportunists. Fetullah Gülen, a Muslim preacher, self-exiled in Pennsylvania since 1999 and once Erdoğan's staunchest political ally, has emerged as the prime suspect. After coming to power in parliamentary elections in November 2002, Erdoğan, fearing that his government could face the typical end of Islamist regimes in the Middle East—a military coup—quickly allied with Gülen, whose powerful network would help to shore up Erdoğan against the staunchly secular military establishment. 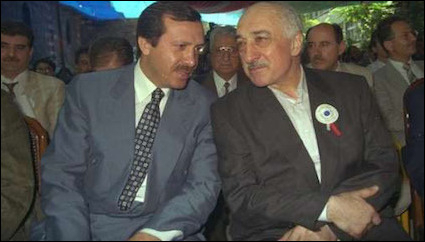 After coming to power in parliamentary elections in November 2002, Erdoğan (left) quickly allied with Fetullah Gülen (right), a Muslim preacher with a powerful network of followers. But the two leaders have since fallen out, and following the attempted coup, Erdoğan accused his former ally of masterminding the uprising. I am saddened for not having been able to unmask this treacherous organization [Gülenists] a long time ago. For that [failure], I am liable to God and to my nation. May God and our nation forgive us ... We tolerated them because they spoke of God ... We failed to see that this structure which we viewed as having a common range [goal] through different ways could be one with different intentions and sinister goals. That common goal was to Islamize Turkey. comes out of this tremendously strengthened ... This has remobilized a base that was getting sort of tired of him. It gave him at least a moment in which he unified all elements of society against a clear threat. Unsurprisingly, Erdoğan has used the failed coup to go after, not just the Gülenists, but everyone he suspected to be hostile to him, including Kurds, leftists, and secularists. To some extent, the failed Turkish coup looked like the "Reichstag fire," the arson attack on the German parliament building in Berlin in 1933. A young Dutch communist, Marinus van der Lubbe, was arrested for the crime, pleaded guilty, and was sentenced to death. But more broadly, though the true origins of the fire remain unclear, the episode was used as a pretext by the nascent Nazi government against its communist rivals whom it accused of plotting against it. The crackdown following the coup attempt has been brutal, frequently violating basic principles of Turkish law. Under the state of emergency, it is dangerous to question whether July 15 was a hoax, orchestrated or tolerated by Erdoğan for political gains. Justice Minister Bekir Bozdag (above) stated that anyone questioning the coup's authenticity "likely had a role." Erdogan's actions following the attempted coup closely resemble historical purges by the Nazis and Soviets. In the days before July 2, 1934, Nazi Germany undertook the "Röhm-Putsch," a series of systematic political executions and arrests of alleged coup plotters within the Sturmabteilung, the Nazi paramilitary group, in order to consolidate Hitler's absolute hold on power. With many social democrats and communists already imprisoned, Hitler also went after conservatives. Just a few years later, in 1937–38, Stalin carried out a massive purge in the Soviet Union. Some estimates place the number of murdered or imprisoned at more than a million people. The purge was Stalin's effort to eliminate past and future opposition groups, real and imaginary. In some ways, the Turkish post-July 15 purge does not look much different. There have been no executions or labor camps, but millions are suffering on suspicion of links with the Gülen movement. During the month and a half after July 15, the Turkish government purged more than 100,000 civil servants and arrested tens of thousands, including nearly half of Turkey's active duty generals and admirals and thousands of judges and prosecutors. Others targeted were journalists, academics, teachers, pilots, doctors, businessmen—even small shop owners. Some of Turkey's biggest companies were seized. Private property was aggressively confiscated. A Turkish cabinet minister said that by September the government had seized more than US$4 billion worth of assets belonging to suspected Gülenists. The crackdown was brutal and often violated basic principles of law. Under the state of emergency, it is dangerous in Turkey to question whether July 15 was a fake coup, orchestrated or tolerated by Erdoğan for longer-term political gains. 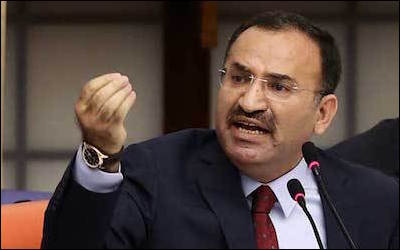 Turkish prosecutors are currently investigating people who have alleged on social media that the coup attempt was in fact a hoax, with Justice Minister Bekir Bozdag warning: "Anyone who suggests the coup attempt was staged 'likely had a role' in the insurrection." More than 10,000 people have been arrested in Turkey, and there are serious allegations of torture. On October 30, the government passed a new emergency law allowing judges to ban a suspect meeting with his defense lawyers for up to six months, prompting an immediate denunciation of the move as unlawful by the president of the Turkish Bar Association. More than 10,000 people have been arrested, and there are serious allegations of torture. Witnesses told Amnesty International that captured military officers were raped by police; hundreds of soldiers were beaten, and some detainees were denied food and water and access to lawyers for days. The Turkish authorities also arrested sixty-two young cadets aged 14-17 from Kuleli Military school in Istanbul and charged them with treason, reportedly throwing them in jail and denying them access to their parents. In September, prominent journalist Ahmet Altan and his brother, academic and columnist Mehmet Altan, were detained for questioning. Their alleged crime? Passing "subliminal messages suggesting a military coup" during a recent television debate. In yet another case, the police detained an elderly woman in a wheelchair because they failed to find her son-in-law. Other political enemies were also swept up in the purges. On a single day, September 8, the government suspended more than 11,000 schoolteachers for suspected links with the militant Kurdistan Workers' Party (PKK). Three days later, the government appointed trustees to twenty-eight municipalities across the country's predominantly Kurdish southeast on the grounds that local officials had provided support to both the PKK and the Gülen network. Elected mayors, too, were suspended without court rulings. Thorbjorn Jagland, secretary-general of the Council of Europe, demanded that Ankara produce clear evidence against coup participants and avoid targeting teachers and journalists simply because they worked for firms run by the alleged mastermind. Otherwise, he said, these actions might be challenged in the European Court of Human Rights, a threat that may further damage Turkey's strained relations with the EU. The insanity also took on absurd forms. In August, the government began to investigate motorists on terror charges if their car number plates featured the letters "FG"—an alleged reference to Fetullah Gülen. Only two months after the coup attempt, the number of Turks traumatized by the purge was estimated between one million and two million. Some 163 years after Tsar Nicholas I told the British ambassador to St. Petersburg that the Ottoman Empire was "a sick man—a very sick man," modern Turkey was again the "Sick Man of Europe." In the early years of Erdoğan's government, the West offered him unconditional support, mistakenly thinking that this supposed Muslim reformist would strengthen democracy in Turkey. 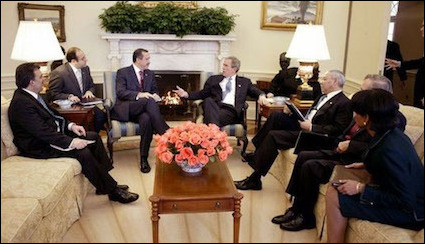 Here, Erdoğan (3nd from left) meets with U.S. president George W. Bush and members of the administration at the White House, January 28, 2004. The government of Turkey often boasts it has NATO's second biggest army. It also boasts of progress on indigenous weapons programs, including missiles, a fighter jet, corvettes and frigates, helicopters, satellites, and drones. But immediately after July 15, more than 8,000 officers, including 157 of the 358 generals and admirals in the Turkish military's ranks, were discharged—44 percent of the top command structure. The coup attempt also prompted the government to transfer military shipyards and weapons production units to civilian authority. Military high schools and war academies were shut at a time when Turkey must fight several asymmetrical wars and militarily engage jihadists in Syria after an incursion launched in August 2016. With Gülen on U.S. territory, Erdoğan challenged Washington for the exile's quick extradition. "We want a terrorist from you ... And you still resist ... What court for a terrorist? Is it too difficult to cancel a Green Card?" the Turkish president said after a visit to New York, in remarks highlighting his limited understanding of American democracy. The U.S.-Turkish tension over Gülen came at a time when the two NATO allies also diverged widely on the issue of the Syrian Kurds, whom Ankara views as terrorists and Washington as potential allies in a ground operation against the Islamic State. Erdoğan even claimed that remarks by U.S. Gen. Joseph Votel, who voiced concerns over the "longer-term impact" of the coup on the Pentagon's relations with the Turkish military, were evidence that the U.S. military was siding with the coup plotters. Indeed, Erdoğan and his men did not shy away from publicly accusing NATO and, in particular, the United States, of possible roles in the failed coup. Turkish defense minister Fikri Isik stated that NATO should sit down and think where it went wrong in response to the coup attempt. According to Justice Minister Bozdag, Washington would be sacrificing its alliance with Ankara to "a terrorist" [Gülen] if it were to refuse to extradite him. Following the coup attempt, Erdoğan's government has reached out to the Russians and moved farther from an alliance with Europe. 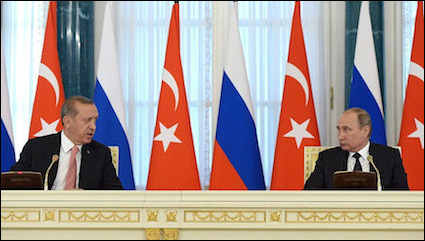 Here Erdoğan joins Russian president Vladimir Putin (right) for a news conference, August 9, 2016, following their meeting in St. Petersburg. Foreign Minister Mevlut Cavusoğlu even threatened that Turkey might look outside NATO for defense cooperation. Then, after the coup attempt, Turkey normalized its deeply strained ties with Russia, signaling NATO that it may change course. Erdoğan apologized to President Vladimir Putin for shooting down a Russian military aircraft on November 24, 2015, which allegedly had violated Turkish airspace along the border with Syria. After the incident, Putin had ordered punishing economic sanctions, imposed a travel ban on Russian tourists visiting Turkey, and suspended all government-to-government relations. Turkey's newfound love affair with Russia not only pleases Putin but also Tehran, his partner in the Syrian civil war, and puts Ankara on the side of the Russian-Iranian-Assad coalition in the five-year-old conflict. Turkey's newfound love affair with Russia pleases Putin and his partner in the Syrian civil war, Tehran. Erdoğan's response to the failed coup further weakened Turkey's already damaged links with the West. As Western leaders called on Ankara to respect civil liberties and democracy, Erdoğan insisted he would consider reinstating the death penalty. "The people have the opinion that these terrorists should be killed," he said in an interview with CNN. "Why should I keep them and feed them in prisons for years to come?" In response, Federica Mogherini, the European Union's foreign policy chief, warned that if Ankara reintroduced the death penalty, it would not be joining the EU: "Let me be very clear on one thing ... No country can become an EU member state if it introduces [the] death penalty." For his part, German foreign minister Frank-Walter Steinmaier expressed serious concern about mass arrests and said that German-Turkish relations were so bad that the two countries had virtually "no basis" for talks and were like "emissaries from two different planets." Erdoğan then threatened that Italy's relations with Turkey could deteriorate if Italian prosecutors continued investigating his son, Bilal, for money laundering. "Italy should be attending to the mafia, not my son," he said. Once again, Erdoğan revealed his true idea of democracy: Leaders give orders to judges who then obey. Prime Minister Matteo Renzi retorted that Italy has an independent legal system, and "judges answer to the Italian constitution and not the Turkish president." But curiously, a few weeks later, the Italian prosecutor dropped charges against Erdoğan's son. Another European country wary of Turkey is Austria. Chancellor Christian Kern said that he would start a discussion among European heads of government to end membership talks with Ankara. He called Turkey's accession talks "diplomatic fiction" and added, "We know that the democratic standards are clearly not sufficient to justify [Turkey's] accession." Revealingly, even the Turks' next of kin were not happy. According to the Associated Press, on August 3, thousands of Turkish Cypriots in their tiny statelet on the divided island took to the streets to protest against "Turkey's attempt to mold their secular culture into one that's more in tune with Islamic norms." Turkish politics is an anomaly in a century-long war of religion between the pious and secular adherents of the same sect of the same religion. The thousands of people, urged by Erdoğan to take to the streets in the aftermath of the failed coup, passionately chanted "Allahu Akbar." They were in the streets not to defend democracy but to defend the man whom they viewed as guardian of their religion. Ironically, the same "pro-democracy" crowds chanted the slogan, "We want the death penalty [back]." Religion was why Erdoğan and Gülen had long been allied against the "infidel" Kemalists, leftists, and seculars. Religion was also why Erdoğan's and Gülen's Sunni Islamist followers are now at each other's throat. Erdoğan and Gülen did not break up because one of them abandoned their common faith. They keep praying to the same God, reciting the same prayers, while their followers keep attending the same mosques. One lesson from the failed Turkish coup is that Islam the religion or Islamism the political ideology will never forge the alliances Islamists often seek. Political Islam is not the right glue for enduring political alliances. Ironically, for many years, Erdoğan feared a coup by Kemalist generals. Instead, the coup attempt came from fellow Islamists disguised within the military as secular officers. Moreover, on July 15, Kemalist officers helped Erdoğan by fighting their crypto-Islamist colleagues. In short, July 15 was an Islamist coup attempt targeting Islamists. For Erdoğan and his camp, the Gülenists were the useful dupes; for the Gülenists, Erdoğan and his AKP bigwigs were the useful dupes; and for both, the pro-government liberals were the useful dupes. Probably all of them were right. The alliance of the faithful was designed to crush the secular system, to Islamize Turkey, by stealth or otherwise, in order to advance political Islam. In the early years of Erdoğan's government, the West offered him unconditional support, mistakenly thinking that this supposed Muslim reformist would build a strong democracy in Turkey by sending the Kemalist generals back to the barracks. They joined the Turkish comic opera as the Western useful fools. They naively believed that if the secular army no longer intervened in politics, Turkey would become a democracy in the Western sense. Instead, Turkey became even more authoritarian in the hands of its two Islamist groups. Turkey's Islamists never wanted to make the country a democracy. They wanted to make it a hybrid, "ballot-box" democracy in which they could win election after election and Islamize. They merely wanted to replace military authoritarianism with an Islamist one. This is hardly surprising. Since the foundation of modern Turkey, the country has been an ideological battlefield. Most Turks–leftist, rightist, pious, or secular—will not be content to merely defend their ideologies democratically. They do not view other ideologies as rivals but as "the other" that must be converted or crushed. Just because a coup was averted on July 15 and the parliamentary system is ostensibly functioning does not make Turkey a democracy. After a pause in his efforts to Islamize and polarize the country, Erdoğan, once again feeling safe, will return to his divisive rhetoric and governance. The Turkish Röhm-Putsch will run at full speed with thousands of non-Gülenists punished on false charges. Meanwhile, crypto-Gülenists who successfully disguise themselves will plan the movement's recovery, thus adding to Erdoğan's deep paranoia. And millions of opportunists will keep informing on their rivals and enemies as Gülenists. Ankara's relations with its Western allies will be further poisoned as Erdoğan's paranoia that the coup was planned abroad deepens. Behind closed doors, countries chasing big Turkish government contracts will promise Ankara that they will suspend local Gülenist activities. But having seen on July 15 how dangerous his nemesis can be, Erdoğan, like most Middle Eastern autocrats, will continue to live in constant fear. Erdoğan's popularity still runs high. His party won 49.5 percent of the national vote in the November 2015 parliamentary elections, and some pollsters put his ratings today as high as 67 percent. The coup provided Erdoğan the opportunity to introduce the executive, presidential system he has long craved. His push is no longer controversial. Ankara averted a coup, and another potential blow to the Turkish democracy is a more pressing issue than how unconstitutionally the president may be running the country. Burak Bekdil is an Ankara-based columnist for Hürriyet Daily News and a fellow of the Middle East Forum. He has written for the U.S. weekly Defense News since 1997. Hürriyet (Istanbul), July 20, 2016. The Wall Street Journal, July 17, 2016. RT TV (Moscow), July 23, 2016. CNN News, July 18, 2016. William Armstrong, "Turkey's 1960 coup, still resounding today," Hürriyet, Sept. 11, 2014; "Turkey commemorates victims of 1960 coup," TRT World (Istanbul), May 27, 2016. USA Today (McLean, Va.), July 15, 2016. The Guardian (London), Aug. 28, 2007. The New York Times, July 29, 2011. The Independent (London), Aug. 2, 2016; Press TV (Tehran), Aug. 18, 2016. Der Spiegel (Hamburg), Mar. 19, 2014. "Turkey's Recent Elections: From March 2014 to November 2015," Carnegie Europe, Brussels, Oct. 22, 2015. TRT Haber TV (Istanbul), Aug. 3, 2016. Associated Press, July 16, 2016. The Guardian, Jan. 12, 2008. Holocaust Encyclopedia, r.v. "Röhm Purge," accessed Oct. 21, 2016. Encyclopædia Britannica, s.v. "Purge trials: Soviet history," accessed Oct. 21, 2016. Hürriyet, July 25, July 28, 2016; "Turkey's Gulen purges," The Economist, Sept. 10 2016. Hürriyet, July 25, 2016; The Guardian, July 27, 2016. CNN News, July 27, 2016. The Daily Mail (London), July 25, 2016. Ibid., Sept. 3, 2016; AA (Anadolu Ajansı, Ankara), Aug. 31, 2016. CNN News, Sept. 8, 2016. EurActiv Media, London, Sept. 8, 2016. Efraim Karsh and Inari Karsh, Empires of the Sand: the Struggle for Mastery in the Middle East 1789-1923 (Cambridge, Mass. : Harvard University Press, 1999), pp. 71-2. MemurlarNet Media, July 31, 2016; Strategic Culture Foundation Online Journal (Moscow), July 28, 2016. Bob Unruh, "Obama Lives in Make-believe World with Muslim Dictator Erdogan," World Net Daily (Washington, D.C.), Oct. 3, 2016. Voice of America, July 29, 2016. Associated Press, Aug. 9, 2016. Time Magazine, Aug. 11, 2016. NBC News, Nov. 28, 2015. Associated Press, July 18, 2016. Ibid., Aug. 2, 2016; Sept. 21, 2016. The National Herald (New York), Oct. 24, 2016. BBC News, July 19, 2016. Bloomberg News (New York), Aug. 11, 2016. Related Topics: Russia/Soviet Union, Turkey and Turks, US policy | Burak Bekdil | Winter 2017 MEQ receive the latest by email: subscribe to the free mef mailing list This text may be reposted or forwarded so long as it is presented as an integral whole with complete and accurate information provided about its author, date, place of publication, and original URL.